Why is Wendy's So Freaking Good at Social Media? Unless you live under some rock, you already know that Wendy’s has been roasting people and even other brands like there’s no tomorrow. From releasing a hip-hop mixtape and flirting with MoonPie to relentlessly roasting McDonald’s, Wendy’s is doing it again this year. There seems to be no limit to their sass, as they continue winning on social media. In what has been hailed as a potential social-media game-changer, Wendy’s social media snark became the talk of the town and also lead to its meteoric rise in 2017. We took a look at their social media profiles on Facebook, Twitter and Instagram from January 1, 2017 to December 31, 2017 to uncover their strategies. 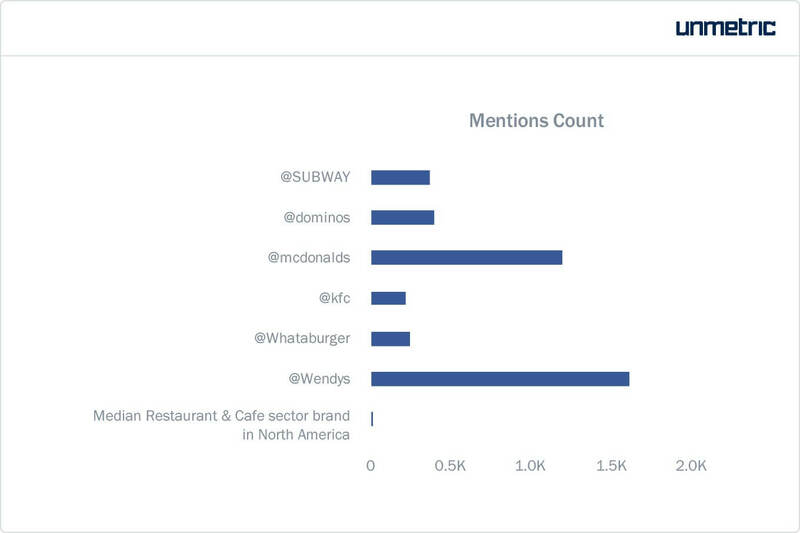 This Wendy’s social media report was put together using Unmetric Analyze. It listens to over 100,000 brands to help our clients create more engaging content, get more certainty around their social strategy and automate their reporting. Wendy’s gained 311K new followers in 2017, bringing its total Facebook follower count to 8.5 million. The brand published 95 posts of which 41 were photos and 29 were videos. Even though photos comprised 43% of the posts, they received less engagement in comparison to videos. In terms of content, Wendy’s primarily published product-focused content on Facebook. The QSR chain opted for peppy lifestyle photos and videos of their products which add to the fun, young brand image that they carry. Wendy’s exclusively utilized paid promotion on Facebook to push their product posts. The brand promoted 60 posts, the majority of the which were promos of their limited-time deals and offers. Social causes that are sponsored and supported by Wendy’s also finds a place on the brand’s Facebook page. The world cloud below, which has been created from brand posts published on Facebook, shows the kind of content being pushed by the brand. The post below is Wendy’s most-liked Facebook post with over 51K reactions. The popularity of the post lies in the history of Wendy’s social media roasts. In the beginning of 2017, a disgruntled customer tweeted to Wendy’s questioning the fast-food chains claims of never freezing their beef. The snide war of words that ensued captured the internet’s attention and Wendy’s doesn’t seem to let any troll get away that easily. Wendy’s had a quirky and out-of-the-box way to drive interactions on social media. They did a live video to promote one of their seasonal beverages. In a setting that looks like it’s straight out of Willy Wonka’s factory, Wendy’s asked the viewers to hit positive reactions for their video, which would in turn power the machine! Their fans seem to have liked the idea as the post received over 2.1 million views and over 60K reactions. The brand ran 7 campaigns during the year. The campaign that received the highest engagement is #50CentFrostyFilms, which promoted a limited-time discount on one of their products. The campaign featured 3 posts, all of which were promoted by the brand. 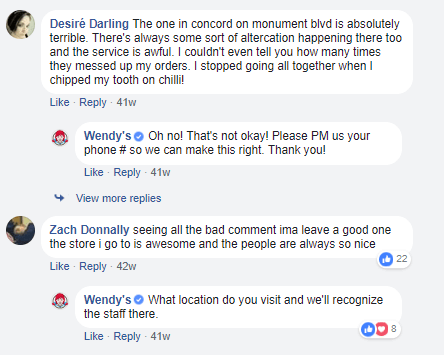 Similar to their now famous Twitter responsiveness, Wendy’s promptly responds to customer complaints and comments on Facebook as well. Their charming, witty and friendly tone is a defining feature of their social media strategy. Fans also initiated 19 conversations on the Wendy’s wall and the brand participated in 8 of these conversations. Wendy’s appears to participate more when fan posts on their wall have more positive vibes than usual. Before we talk numbers, I bow down to the best on Twitter. Wendy’s has been lighting up our newsfeed (and lives) for some time now. Their phenomenal growth on social media and much-publicized sass is a testimony to this. Wendy’s holds the golden standard for customer service on Twitter, no questions asked. Remember when some guy on the internet won free nuggets for a year when he tweeted to Wendy’s? Carter Wilkerson tweeted to Wendy’s asking for free nuggets and paved his way to become the author of the most-retweeted tweet in the history of Twitter. His quest for chicken nuggets, #NuggsforCarter was retweeted a staggering 3.6 million times! Wendy’s was the only brand to break into the top ten tweets for 2017. In the beginning of 2017, Wendy’s had just over 1 million Twitter followers. The brand added 1.2 million new followers by the end of the year, bringing its fan count to 2.24 million. Wendy’s registered a 126.5% follower growth rate in one year, a figure that stands tall in comparison to the 5.9% median growth seen in the Restaurant & Cafe industry in North America. 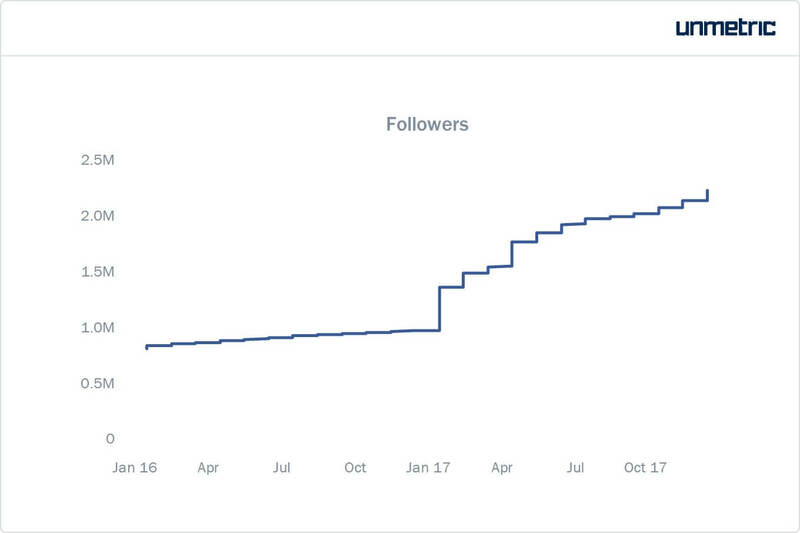 The graph above charts the follower growth from 2016 through 2017. There is a clear jump in followers from January, 2017 to December, 2017. So, what happened in 2017? Let’s dig deeper. The brand tweeted 35K times, i.e. 96 tweets per day on average. 99% of the tweets were replies, with a meagre 183 being proactive brand tweets. But, let’s not trivialize the small number. Less is definitely more for Wendy’s. For instance, the brand threw massive shade at its biggest competitor McDonald’s when they accidentally tweeted placeholder text for Black Friday. Wendy’s took the chance, fired shots, and as expected the internet took notice. The tweet was retweeted 281K times with over 8K replies and was the most engaging tweet for the brand in 2017. The brand’s Twitter dig received more interactions than McDonald’s original tweet! They can’t stop with the digs. Not just McDonald’s, the fast-food chain resorted to a friendly banter with fellow restaurant chain Wingstop in what feels like an episode from ‘Epic Rap Battles of History’. Wendy’s confessed that this is their all time favorite tweet in their Reddit AMA. The quick-serve chain’s one-to-one with brands have created huge engagement in terms of retweets and replies amounting to great audience activity on their Twitter. Here’s Wendy’s roasting fast-food chain Hardees’ and getting blocked! Tell us the fourth person to walk on the moon without googling it. Reply rate is the sweet spot of Wendy’s Twitter strategy. It has been found that 78% of the people who tweet to any brand expect a reply within one hour. In 2017, Wendy’s replied to over 20K tweets in an average of 15 minutes per tweet! Their social media team is definitely on the go, engaging as soon and as sassy as possible to keep their customers happy. We are sorry to have let down you and your 17 followers. 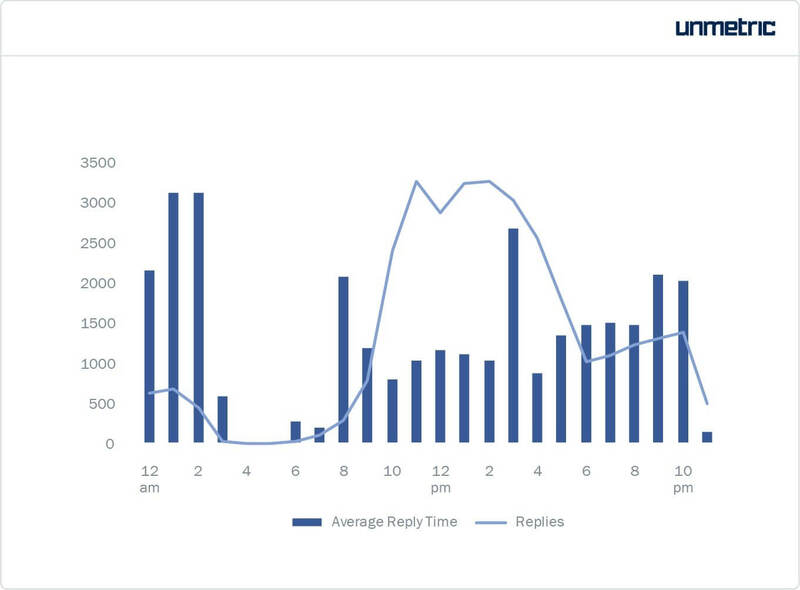 Brand mentions peaked from 7 PM to 10 PM (EST), with over 100K mentions, while the reply rate peaked from 11 AM to 2 PM. Wendy’s also ensured that customers are replied to on all days of the week. Twitter mentions peaked on Wednesdays and the brand replied the most on Wednesdays as well. Throughout the year, Wendy’s maintained a reply rate of 23 hours on average, making sure that their customer queries are always responded to within a day. Why is everyone tweeting to Wendy’s? Wendy’s had a staggering mentions count of 1.6 million in comparison to the median in the Restaurant & Cafe industry in North America with 325. The graph below benchmarks Wendy’s against some high performing brands from QSR industry. A really high mention rate for a brand suggests at something non-typical – it could be angry customers or a controversy or even a viral campaign. For Wendy’s it’s just another day on Twitter. Their epic clapbacks and salty retorts have made them a fan favourite on Twitter. Most followers are spoiling for a fight with Wendy’s and they sure don’t dissapoint. Everyone on Twitterverse took notice of Wendy’s, including celebrities. Ellen Degeneres did a funny spot on her TV show along with Bradley Cooper. In order to stop the ‘nugget boy’ from outdoing her record of the most-retweeted tweet, the duo asked for help from fans. What followed was a twitter exchange between Wendy’s and Ellen and even Twitter couldn’t stay away. It’s a shame Bradley can’t spend his whole day on Twitter. And yet he’s so happy and productive. How can that be? In December 2017, the movie critic Eric Kohn asked Wendy’s to name their favourite film of 2017. Lady Bird was pretty great. Also, enjoyed The Big Sick and Get Out, and Logan remains surprisingly high on the list. Also, Blade Runner was visually stunning. Before long, Wendy’s was weighing in on whether Twin Peaks should be considered a TV show or movie? The brand sure knows how to hold everyone’s attention. @Wendys do you think Twin Peaks is a TV show or a movie? Wendy’s added 243K new followers on Instagram, bringing its total follower count to 650K in 2017, registering close to 60% growth rate. The brand published 60 posts, in comparison to the 177 posts that the median Restaurant & Cafe Instagram Account from North America published. 80% of the brand posts were photos, while the rest 20% content were videos. Photos also saw higher engagement than videos. It’s hard to keep a deal like the 4 for $4 with a Double Stack under wraps. At participating Wendy’s locations for a limited time. Includes 4-piece nuggets, small fries and drink. Not valid in AK and HI. Wendy’s cross-posts content on their Facebook and Instagram. Their Instagram strategy focuses solely on their product. The content prominently feature their burgers and beverages as the centerpiece in fun backdrops. Similar to Facebook, product posts involve announcements of limited time offers and deals, and also include the trademark Wendy’s wit through fun captions. There are plenty of fish in the sea, but the best are found in our Premium North Pacific Cod Sandwich. Visually appealing, still life images and videos of products with a red and white color scheme in the background is the uniform content strategy on Instagram. The hint of red and white, the colors consistent with their brand logo and product packaging, is found in most of their posts and is an exercise in visual branding. Not your boring ol’ chicken sandwich. The Asiago Ranch Chicken Club is something special. This post celebrating their anniversary is most engaging post of the brand with 9K likes. 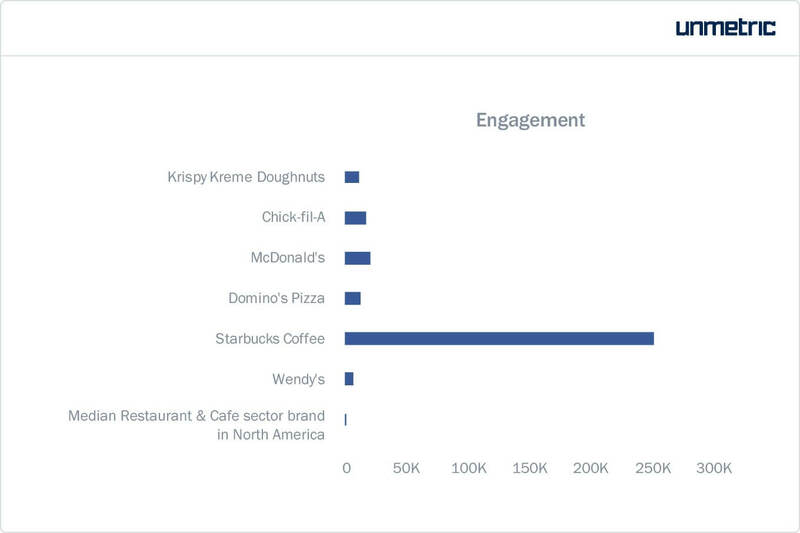 Even though Wendy’s registered higher engagement than the median Restaurant & Cafe Instagram account from North America, their Instgaram engagement appears meek in comparison to other QSR chains. By benchmarking Wendy’s against the top performing brands from North America, it is quite evident that Wendy’s could do more to translate their social media chops on Twitter to Instagram. A witty comeback to an online troll launched Wendy’s onto the world stage in 2017. The brand hasn’t turned back since, replying to almost everyone who tweets to them. But, their sensational rise isn’t an overnight event with a number of notable social media campaigns like the ‘Pretzel Love Song’ and ‘Burger Pie Chart’ in the past. Here’s what brands can learn from them. At the end of the day, it comes down to how customers view your brand. There’s a lot of brand awareness and popularity for Wendy’s because of their distinct personality. Their fearless humor and sarcasm has become their social media trademark. It is extremely important that your brand is able to cut through the noise of social media and stand out. Coming across as fun could be valuable for your brand because it creates a positive positioning for the brand and it worked for Wendy’s. The spontaneity associated with them adds more authenticity to the brand much more than a big planned marketing campaign could. If you are trying to position yourself as a hip place to grab a meal, talk like how your customers would. This is exactly what Wendy’s did. They identified their target demographic – the young, millennial and spoke their language (‘nuggs‘ instead of ‘nuggets’). Their tongue-in-cheek responses and often rude remarks has positioned themselves as a favorite among their target audience. Wendy’s has also been able to accomplish the balance between sounding too pushy with their promotional content and engaging content. The most effective strategy is to stay true to your brand’s core values and channel your social platforms to cultivate a brand voice that is consistent with your brand identity. “Everything interesting in marketing has an inherent risk in it”, according to Brandon Rhoten, Head of Media for Wendy’s. Wendy’s took the risk and aced it. Their approach to social is quite an unusual strategy, especially since brands are typically concerned with appeasing their customers and being politically correct. Wendy’s seem to have scored a social media hit through their cheeky personality. When big brands often get chastised on social media, fans have so far played along with Wendy’s, other than few of the usual grouse from haters. Wendy’s had a “crazy year on Twitter” without doubt. Their extremely responsive, prompt social media team has been winning accolades. Social media is all about immediacy and interactions on social platforms are about one thing – people want answers and they want them now. Wendy’s address almost all tweets and complaints as is humanly possible. It’s not all about their edgy persona, they are apologetic in case of delayed responses and are hell-bent on resolving the issues customers have. Not just on Twitter, Wendy’s have also successfully utilized the little-used tool for Facebook success – responsiveness. An online feud with your competitor may not be the most practical marketing strategy, but Wendy’s and their beef with other brands on social media seem to have worked wonders for them. Most of the times, brands online are just force-feeding their latest value proposition to their audience. This is obviously a rudimentary marketing strategy and can come across as boring and inauthentic. Customers like to see brands as human entities with fallibilities and this is why we love to see brands interacting with each other. Wendy’s has multiplied their brand reach by calling out their competitors in the snarkiest way possible. Brands can see huge benefits from this sort of exposure on social media, as long as the interaction is lighthearted. Most brands have one-hit wonder campaigns that quickly fades away. Wendy’s bucked that trend and managed to be in the news and on top of our minds due to their consistency. Wendy’s maintained a consistent pattern, not just in terms of frequency of posting, but on the content they post. The brand is prolific on Twitter, while posts less on Facebook and Instagram – and this is exactly what these platforms need. They maintain their madcap voice at all times, instead of the occasional one-liners or campaigns. This level of consistency leads to consistent engagement by keeping your audience hooked to your social profiles. Wendy’s bold moves and experiments on social media is continually attracting a lot of attention. Their daring, interesting approach has put them on the map and is worth exploring. This report was put together using Unmetric Analyze. Analyze the social media habits of over 100,000 brands, reduce your time to insight and discover new strategies that lead to higher engagement.